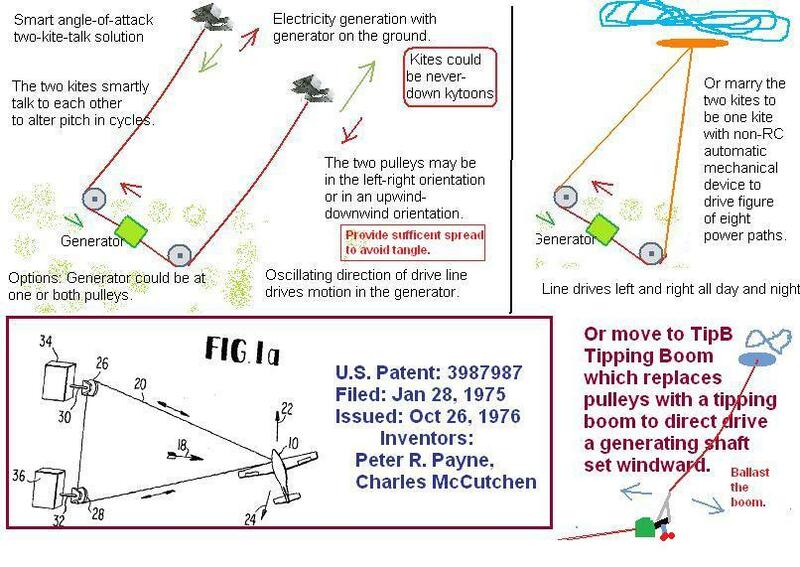 Two-Kite Solution (TKS) The kites talk to each other robotically; one is in strong pull while the other is in low-pull; the strong pull kite pulls the driving line through generator on the ground; then reverse is triggered and the kites morph so the other kite becomes the driver. Smart and robotic. On-line triggering stops on line that operates an angle-of-attack line. Aloft in kites have oscillating spiral-spring motors that wind up and then release; consider having one kite fixed for lower power gain, if only one kite has the trigger oscillating mechanical device. : ) Marry the two kites to be one kite at the peak of a triangled loop line so that the TKS morphs to the One-Kite-Solution (OKS) with an onboard automatic figure-of-eight controller that powers left and right to draw the drive line. Two-kite solution evolves to One-kite solution (OKS) without radio-controlling (RC)--- a bow to DaveS' drive to avoid RC. Of course, the OKS has been patented and is in public domain now. OKS demos at all high schools of the world might help to change the future game. Charge E-bicycle batteries or ultracaps with OKS. Use wheels of bicycle for the pulleys anchored with ambient sand/rock/tree tie outs. Infinite e-travel from OKS; and when conditions permit, just tug bicycle or cart with the kite. The two kites may be LTAKs for a practical never-down solution. Spread two-pulley ground feed of drive line through generator. The two mooring pulleys may be left and right or they may be upwind and downwind. The spread of the mooring pulleys may assure non-interference of lines. Generator is at one of the pulleys or both or between...several options.